The kit includes (2) powder coated formed steel brackets, (4) correct 1/4-20 cage nuts for the radiator side brackets, and (4) 1/4-20 x 1/2" hex head coni sems bolts to mount the brackets to the radiator. Used on 1969-73 B-Body and all E-Body cars with the 2949 130 or 2998 328 fan shroud and 22" radiator. 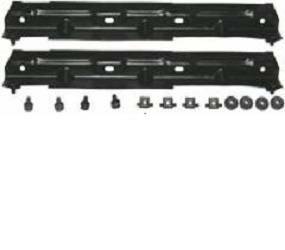 Also used on 1969-72 C-Body cars and 1972-79 Dodge trucks with 22" radiator.